Prime Minister Theresa May on Monday published further assurances from the EU on the eve of a crucial parliamentary vote on her Brexit deal and warned MPs that rejecting it would lead to "paralysis" that could see Britain stay in the bloc. European Commission President Jean-Claude Juncker and European Council President Donald Tusk repeated in a letter that they would not reopen the divorce deal, but offered clarifications with "legal value" on a controversial clause. 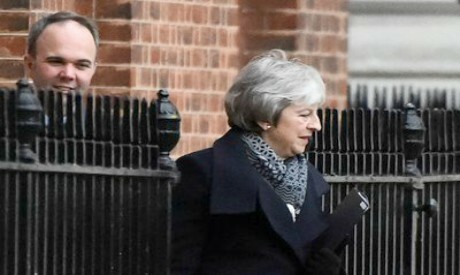 May admitted their offer fell short of what she wanted, but said MPs now had the clearest assurances they were going to get -- and should support the deal. "Whatever you may have previously concluded, over these next 24 hours, give this deal a second look," May told MPs in parliament. "No, it is not perfect. And yes, it is a compromise." As MPs prepare to finally vote on Tuesday evening, large numbers of her own Conservative MPs and her Northern Irish allies are still strongly opposed. In a further setback, government whip Gareth Johnson -- a Brexiteer and one of the officials charged with getting MPs to vote for the deal -- announced his resignation. "It is clear this deal would be detrimental to our nation's interests," he said. In a speech in Stoke, a Brexit-supporting city in the English Midlands, May repeated that the only way to avoid "no deal" was to support her agreement. "If no deal is as bad as you believe it is, it will be the height of recklessness to do anything else," she said. But with growing calls to delay Brexit or call a second referendum, she added: "It's now my judgment that a more likely outcome is a paralysis in parliament that risks there being no Brexit." May signed the divorce deal with other EU leaders in December after 18 months of tough negotiations, but it has faced huge opposition in parliament. The most contentious element is the Irish border backstop, which would keep Britain tied to some EU trade rules, with even closer alignment for the province of Northern Ireland, if and until another way was found to avoid border checks with the Republic of Ireland. Tusk and Juncker said the EU "does not wish to see the backstop enter into force" and noted that if it was necessary, it would only be temporary. The pair repeated that similar assurances to this nature made at an EU summit in December "have legal value". The main opposition Labour party, which favours remaining in a permanent customs union with the EU, also dismissed the EU's assurances. Labour leader Jeremy Corbyn said that since the postponed December vote, May had "completely and utterly failed" to get the EU to change its position and the letter from the EU leaders contained "nothing but warm words and aspirations". He called the deal a "damaging shambles" that was "clearly bad for this country". Corbyn has promised a vote of no confidence on the back of a government defeat on Tuesday. If the government loses the confidence vote, parties would have 14 days to find an alternative that had the support of a majority of MPs, or an election would be called. Corbyn has conceded that, if the party won power, parliament would likely need to delay Brexit so it could renegotiate the withdrawal agreement. More than 100 cross-party members of the European parliament promised to back a delay to Brexit to allow voters to think again, in a letter to British citizens. May said the Brexit date should not be delayed -- but did not rule out the prospect. "I don't believe that the date of March 29 should be delayed," May told parliament. She also ruled out holding a second Brexit referendum -- an option called for by a growing minority of Remain-backing MPs as the only way out of the parliamentary deadlock.